what do you think of the black spider man in movie? the bad side of hero? what do you think of the black spider man in movie? is it reflects the bad side of the hero? thank you very much. thank you for replying. hehe, aggressive spiderman?hehe.maybe. thank you very much. First of all, I totally love the film. I even got into an argument with my friend because he thought it was cheesy and apparently it wasn't that good still I abused him (LOL.jk) so I won our argument. But anyway, I thought he was cool since he showed spidey's bad side. This just shows that every human being has a bad side in them even super-heroes! I 100% agree with you. I also think that spidy looked cool in this part & even superhero's have a bad side. thank you for replying. hehe. i got it. by the way, do you looking forward to spiderman 4? hehe.maybe it will be wonderful. thank you very much. there's part 4 already? looking forward to that one then. thank you for replying. cnofronting the bad side. both spider man are so cool. if you have choice(two spider man fall in love with you),which spider man do you want to choose,red spider man or black spider man? thank you very much. LOL you make me laugh :) i think i will choose the black one he has more character and attitude and after we both have explored the darker side maybe i will change him to the red one! o then life will get so boring! thank you for replying again. hehe. you gave me a good answer.hehe. turn the black spiderman into red spiderman.hehe. thank you very much. no , i dont think so , in this movie actor changed to real spider and showed us that what was the reality ! thank you for replying. maybe you are right. thank you very much. yes,i agree with you,all the things in the world are two-faced.Black sider man is a human,he can not cast off human's inbeing,so the actor showed us a true spider man to audience,and let the character is more pressed close to the live. thank you for replying. everything has two sides, so does the human beings. thank you very much. Sorry,my friend,i've never watched the movie which there's a black spider man. hehe, you should go to see this film. it is deserved to see. thank you very much. yes i found spider man more attractive but as we all know original is always original. and indeed it reflets the bad side of spider man now he feel him self more powerful more stronger and he does thing which is completly opposite to his persionality. thank you for replying. hehe.original is always original. thank you very much. Yes and no! Yes because the thing needs a living thing to copy first before it gains its own life so i think during the first part when Peter Parker was having fun with his new found power it was still all him but i think during the later part was not Peter Parker anymore it was the black thing taking control of Spiderman. thank you for replying. you are right.later he out of control. thank you very much. ya..the black spiderman is cool, too bad it is a evil one. He look more power compare to the good side of spiderman. At first , i though the evil spiderman will destroy the enemies with his power in the movies. haha. As a whole, i don;t really like the movies. Not very nice compare to spiderman 2.
thank you for replying. i don't agree with you. 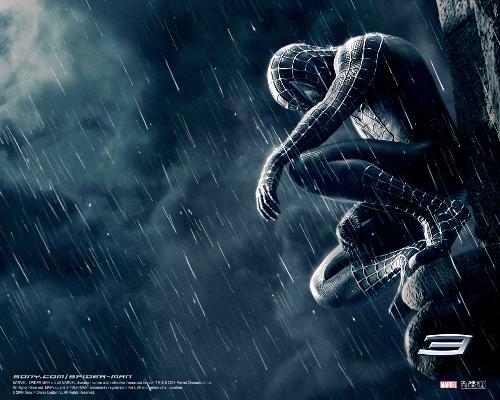 i think the spiderman3 is much better than spider2.you know what?there are so many mentality description of people in spiderman3. thank you very much. Hi,laiyongjun I think the black spider is a good conceit in this movie.Not only the hero but also every human being has both two sides inside. But when these two sides appear on a hero,then the story will be more reitcular. "The more power you have,the more responsibilities you should shoulder. "In this movie,spider man must fight for his powerful enemy and a more powerful himself.That's great. thank you for replying. "the more power you have, the more responsibilities you should shoulder" i know this sentence come from the end of spider man 2. hehe. you are right, maybe everyone should fight for his enemy and a more powerful himself. than you very much. I think the bad Peter Parker looks good. I like the black side much better. It shows the frustrations of being a superhero. How you sacrifice love for your responsibility as a superhero. All of us has dark sides to which we do not want to get out. But keeping it inside us lets it control us. thank you for replying. hehe. the black spider man is so cool. i also like it very much. by the way,do you think in the movie which one love Mary more, spider man or Harry Osborn? why? thank you very much. I seriously loved the movie and its action. The blaack side of spider man shows the nowaday gangster mentality of guys, who dont even care about hurting others feelings and as said in the movie, "intoxicating" represents the feelings correctly. Something of a bad apple among the bunch of good apples? thank you for replying. something of a bad apple among the bunch of good apples. it is meanfuling.hehe. thank you very much. Yeah I saw the previews on Starz for Spiderman 3 and when he turns black that is suppose to be the dark side of spiderman. So he will be in a battle with his self with good and evil. Sounds neat. thank you for replying. i agree with you .hehe. thank you very much.